Two more items for the Motorola GP300 arrived from Hong Kong today, an 1800mAH NiMH battery pack and a charger. I'm a bit dubious about the charger. I put the battery pack on the radio and started charging it, and when I checked six hours or so later the battery pack and radio were really hot. I would have thought the charger should have shut off by that point. So I'll have to watch the charge times. I wanted to have another try at programming the radio using a newer version of the software from the hampedia site but when I started up the Toshiba Satellite 1800 and tried to go into the Bios to re-enable the cache (which I disabled yesterday to slow the computer in the hope of overcoming the programming problem) it asked for a password. Somehow when I disabled the cache I must have accidentally enabled a Bios password, but of course as I didn't do it intentionally I have no idea what the password is. I tried to start Windows 98SE but it took 20 minutes to load and was unusable once it eventually did. So that's that. But in the end another solution was found. I registered with the forum at the curiously named Batwing Laboratories website, which apparently is the fount of all knowledge for all things Motorola, and posted about my problem there. Tom in D.C. (W2NJS) replied that the DOS in Windows 98SE wouldn't do, I must use MS-DOS 6.22. Now I was programming micros since before IBM invented the PC. I've read Ray Duncan's "Programming MS-DOS" from cover to cover several times so I was pretty much an expert on the subject at one time (though I've forgotten just about all of it now) and I would never have thought that there were any differences between the two versions affecting the use of the serial port. But Tom was firm enough in his advice that I downloaded an MS-DOS 6.22 boot CD image and made myself a boot disk. It wouldn't recognize my Windows 98SE partition so I had to vape that, reformat under MS-DOS 6.22 and set everything up from scratch. Fortunately I still remembered enough about things like config.sys and autoexec.bat to get it to work. I reinstalled the programming software, connected the interface, and this time I got "Radio Communication OK!" Tom in D.C. probably heard my cheers from there. So I was finally able to program eight 2m frequencies into the radio - five simplex channels plus the three local repeaters - and have just completed two QSOs on the GB3LA repeater from inside the house using a quarter wave telescopic whip, so it works! 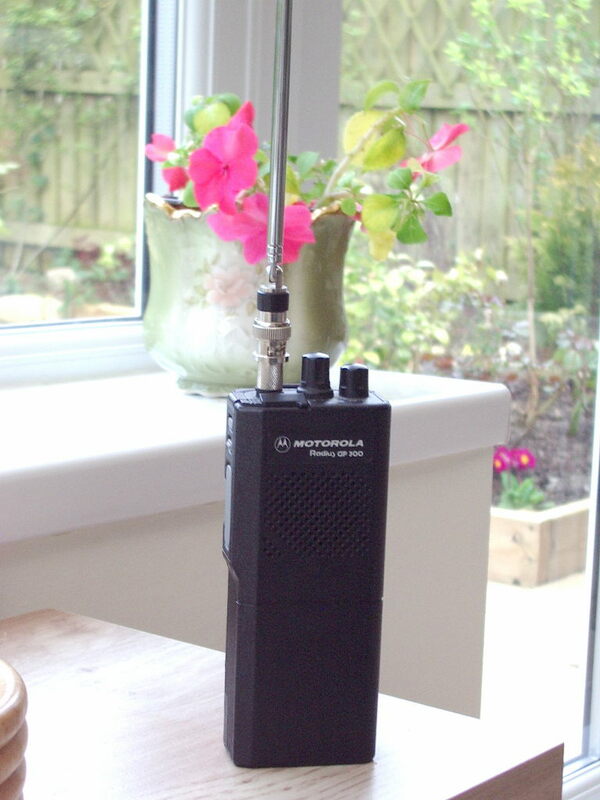 The Motorola GP300 seems to work a bit differently to ham radios. For example, there are three power levels but the power level is fixed for each channel, so if I set High power in order to access a repeater from home I can't reduce the power to Low to save batteries when I'm in line of sight of it from a hilltop. And if you want a Scan function you have to dedicate a channel to that. Possibly there are some tips for setting up these radios for ham band use that I'm not aware of yet. But even if there aren't, it's still a nice radio for £1. Even if by the time you add in the cost of the programming interface, the battery pack, the charger and the adapter that converts the Motorola proprietary antenna socket into a BNC it ended up costing more like £40. Hi Julian. I've just started messing around with an older Motorola Spectra (A7). Your comment about the high/low power settings on the same channel makes sense in that context. On the Spectra, they call them "modes." Meaning you configure the radio a certain way (frequency, power output, etc.) then save that as a unique "mode." Then switch modes depending on operation. Kind of makes sense when you consider how public service personnel operate in contrast to how HAM's operate.. Thanks for your story regarding DOS. We're also investigating this in programming our Spectras. Case you need a boot diskete with DOS I can provide you one image disk. Have one allways around to programe a DDS generator.